Property 4: Luxury Apartment, Near Subway, Perfect for Work or Play! ** Spring Special**Private floor is yours in beautifully restored brownstone! Property 8: ** Spring Special**Private floor is yours in beautifully restored brownstone! Property 20: Brooklyn Brownstone rental. Property 21: Straight To Manhattan! Property 25: 15 min to Manhattan. Brooklyn Luxury Modern Elegant apartment. Private patio. Beautiful, fully renovated, single family townhouse that accommodates up to 11. Property 27: Beautiful, fully renovated, single family townhouse that accommodates up to 11. Property 34: Exceptional Comfort and Location! Property 36: Historic Brooklyn Apartment w/Stunning City Views! Property 39: Well designed apartment with yard! 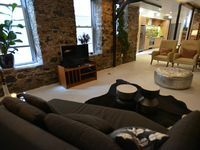 Amazing 2 BR Brownstone Apt. Property 48: Amazing 2 BR Brownstone Apt. This place was great. The neighborhood it was in had everything we needed, restaurant, market, liquor store and subway station. Manny met us, walked us through his place. It was clean and comfortable and convenient. We took the subway every day and everywhere. I give it 5 stars! Amazing accommodations. Amazing host. Terrific location. We truly enjoyed our stay and didn&rsquo;t want to leave! We will be back soon. Thank you.